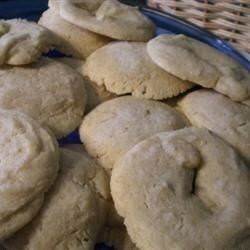 "A simple traditional Arabic recipe for cookies similar to shortbread. The wonderful flavor comes from the cardamom, which is fairly expensive, but very worth it. I actually prefer them without the almonds, but you might add them if you like." In a medium bowl, stir together the butter and sugar until smooth. Stir in flour and cardamom until well blended. Pinch off tablespoonfuls of dough, and roll into a thin rope. Join the ends together in a circle, and place on a greased cookie sheet. Place almond halves on the joints where the circles come together. Bake for 20 minutes in the preheated oven. The cookies should remain white, but may turn golden at the very edge. The traditional way of making ghoraybah is by adding a few drops of Arak (lebanese spirit). It gives it such a distinct flavor. These were delicious. I doubled the cardamom and added a pinch of salt and everyone thought they were the best version of shortbread cookies they'd ever tried. The cookies come out a little bit crunchy, but if you think of them as cardamom shortbread, it's great! The flavor and aroma are wonderful.